Prefer to watch on your TV? SOLACE: Wisdom of the Dying grew from Camille’s intimate experiences as a hospice nurse working with people at the end of their lives. Based on the need to reintegrate the end of life journey, as a natural and sacred human process, she works closely with patients, families, health care organizations and professionals. 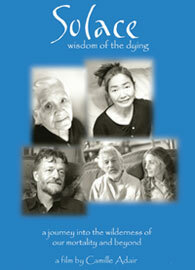 Solace Wisdom embraces the lost art of dying. This includes how to be with dying people and their communities as a holistic life practice. The below button will take you to PayPal to purchase the DVD.